Denise Easton | 3-D Change, Inc.
Denise is an experienced entrepreneur and consultant who finds inspiration at the “busy intersections” of organization development, knowledge management, strategic innovation and complexity models for business success. 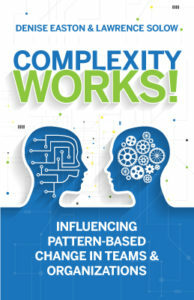 Denise’s work on helping clients build adaptive, innovative and financially successful organizations by understanding and influencing the dynamics within their unique complex systems. Denise works across the corporate, public, education and non-profit domains which has provided the foundation for her research and thinking on the synthesis of complexity science, business applications, human systems and organization design and strategy. Denise has published in numerous publications and is a frequent speaker and panelist on the topic of complexity in organizations, technology and adaptive knowledge management practices.